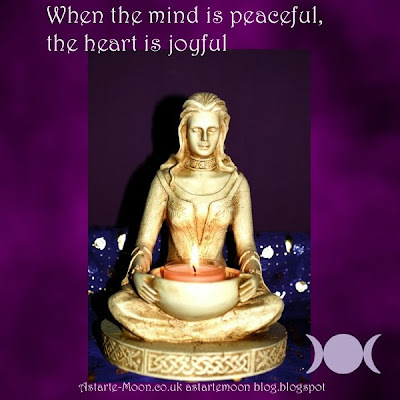 Astarte Moon Inspirations a life closer to nature's rhythms : When the mind is peaceful, the heart is joyful. Positive inspirational Goddess quote. When the mind is peaceful, the heart is joyful. Positive inspirational Goddess quote. When the mind is peaceful, the heart is joyful. This is the Goddess statue I have on my fire place at home. However bad and stressful a day I have, I come home to her, light my incense and she reminds me of the importance of peace. Life is so much easier, less stressful and much more enjoyable if you can carry that peace around you all day.